Classic Man: "Don't Mess With A Bear"
Frequently in this space, we will consult a different entry in the 1987 book The Modern Man’s Guide to Life to see how the advice therein has aged. On Monday, we touched on how to deal with going bald; today, we’re talking bear alarms. If you’re camping, you risk running into bears. But do you really need to wire your camp with a so-called bear alarm? A bear can smell food that’s still sealed in a tin can and will gladly invade your camp to get at it. Take the precaution of providing yourself with a bear alarm that will permit you to rest easier. Before retiring, place all of your food beneath a stack of pots and pans so the bear will have to make a lot of racket to get the goods. This will have you awake and on your preselected route to safety before he can consider pawing at you. Bear alarms are best set up away from camp—ideally in a canoe or flatboat that’s been tied fast to the shore. You should definitely take precautions to keep bears out of your camp, because a bear’s nose is 100 times more sensitive than a human’s. Meaning, if they smell it, they will come. So when you bed down for the night, consider instead putting all your “smellables” (i.e. food, hygiene products, and batteries) into a bear bag, and hoist it up into a tree so the bear can’t get to it. You can buy a special bear bag if you’d like, but you can also just use the sack from your sleeping bag. The Leave No Trace Organization has more details on this. Bear alarms are absurd. There are many other more reasonable precautions that campers can take to keep your food away from bears. If a bear is hungry enough to rummage through your pots and pans, he’s only a few seconds away from ripping through your tent and giving you the same fate as Timothy Treadwell. 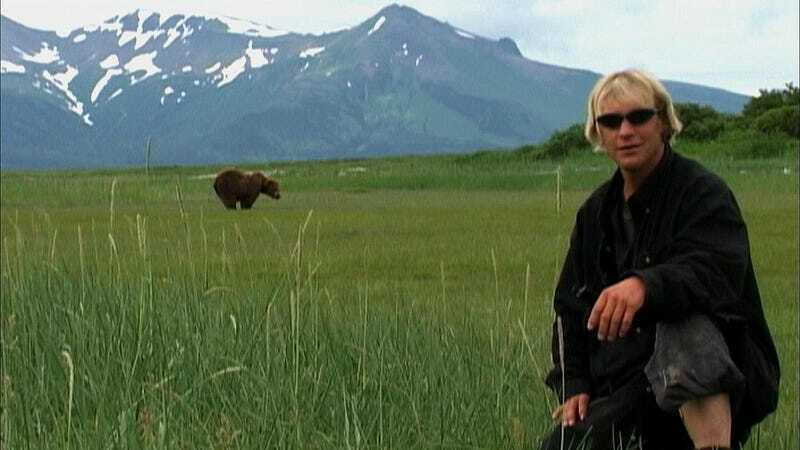 By the way if you haven’t seen Grizzly Man, you should. It’s like watching a train wreck.